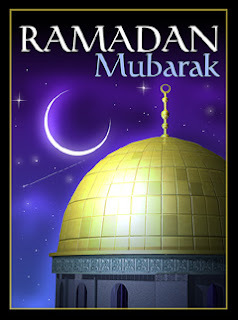 Ramadan Mubarak to all my muslim friends! And here's some Ramadan Information for all my non-muslim friends. Today is the beginning of the month of Ramadan, and yesterday was the end of the month of Shaban, in the Islamic Calender. And among the many things that awe me in Islam is this 'Holy Month of Ramadan' that begins today; a month of fasting for muslims all over the world. People fast from sunrise to sundown, abstaining from food, drink, smoke, entertainment and even sexual relations with their spouses. Many attempt to spend time tuning up their spiritual lives. I had a colleague who actually completed reading the book of Quran during Ramadan last year. She had said that that was her target and went on to do it. Many still do. That is why Ramadan month is often termed as a time for inner reflection, devotion to God, and self-control. Special service in the form of the distribution of food and clothing for the needy, is also undertaken by many muslims or muslim charity organizations. SALAH - Prayer five times a day (Mosques call for prayer (or Adan) at dawn, mid-day, late-afternoon, sunset and nightfall. Listen to some Azzans/Adhans here ). ZAKAH - Giving to the poor from what God gave. [All wealth is God-given, and individuals are merely trustees. Zakah actually means 'purification' or 'growth' and one can be purified by setting aside some of their wealth for those who need]. SAWM - Fasting in the month of Ramadan. ROZA is another word for the same. Bahrain, despite its cosmopolitan nature, is still proudly Islamic. And during daytime in this month, eating, drinking or smoking in public is not allowed. Cafes, restaurants and other eating places are closed. Public - muslim or non-muslim - will not be seen eating anywhere. People dress modestly, and no blaring music is heard from cars. All Discos, Bars and Night Clubs cease their activities. But ofcourse, like the world over, the elders complain that the younger men and women are not observing Ramadan in its true spirit, with devotion. They say that during Ramadan nights, they infact eat more than they eat during normal days. And they stay up late nights, as most schools, universities and offices work for less time during this month. One muslim friend joked saying that some young people look forward to Ramadan-Month not because its a time of fasting but because its a time of feasting! But all said and done, having seen the months of Ramadan, living in Bahrain, for eight years now, I can only say that the fervour and the devotion with which it is observed is remarkable. To abstain from drinking even water during the "Hot Arabian months" is not easy. Its an amazing test for self-control. I tried and fasted a couple of days during some Ramadan months, and I must say its tough!! Most importantly, the devotion, the charity, the seriousness and other aspects of life of the muslim brethern is simply admirable. With each passing Ramadan, my respect for my muslim friends just keeps growing. Happy Ramadhan Joel... Great post! Ramadhan, used to be much tougher in the past, as my parents always say. You know, especially in our very hot summer, people didn't have cars to transport, Air conditioners to resisit the heat, and many other facilities that now a day are widely available for making the holy month easier for all. But, still, this month is a very special one for me. On the contrary, I feel that I can work much better during the day times, than in any other month of the year.